My dad was a Navy officer, yet he was sent to Fort Leavenworth, Kansas when I was eleven years old. Yes, Kansas: not exactly a seafaring state. Dad's assignment was a teaching job at the Army's Command and General Staff College. It was an important job, but did I care? I did not. I was on a desperate mission of my own: to convince my parents to buy me a horse. I began taking riding lessons at The Fort Leavenworth Hunt Club, where the tack room to me was like the opium den to Sherlock Holmes. There were saddles and bridles exuding those intoxicating odors of horse sweat and saddle soap. The wooden boxes were filled with curry combs and hoof picks. Men and women strode about in jodhpurs and black leather boots. And, of course, there were the horses, their magnificent heads bobbing over stall doors, ears pricking as I whispered secrets to them or fed them carrots. I'd been reading horse books all my life: Black Beauty, The Black Stallion, Misty of Chincoteague, My Friend Flicka, Thunderhead. Any book with a horse on the cover belonged on my shelves. I'd been collecting horse statues for years and, whenever I rode my bike around the Army base, I popped wheelies and pretended my bike was a horse rearing on its hind legs. I became a barn rat, helping other riders groom their horses after a ride. I especially liked currying the horses' coats in slow circles, making the animals arch their necks in pleasure. If I didn't have a horse to work with, I'd follow the older girls around, watching them closely as they stood with one hand on a jodhpured hip or tucked their hair beneath velvet hunt caps. I saw the power in these girls, power that came from the confident way they tamed these huge beasts with a cluck of the tongue and a bit of leather. Finally, my parents gave in. As Mom reasoned with my father, sitting on a horse under the watchful eye of an Army instructor had to be safer than me spending my free hours in some teenage boy's smoky basement. She convinced him to buy a small gray mare that I named "Ladybug" because my fictional heroine, Trixie Belden, had a horse called "Lady." Ladybug looked docile, with her long-lashed eyes and sweet brown freckles. However, my new mare had a nasty habit of holding her breath whenever she was saddled, so that it was impossible to get the girth tight. The first day Mom mounted Ladybug, the horse expelled her breath and the saddle slid upside down. Mom ended up being dragged through the dust by one stirrup. "That horse is cute but tricky," Mom pronounced, when she managed to get herself untangled. Dad eyed my new horse with suspicion. "That animal doesn't seem safe to me," he said. "What if Holly gets hurt?" "Oh, she'll be fine," Mom said breezily. "You have to get thrown at least thirty times before you're a real rider." My father was right. I did get hurt. Ladybug threw me off many times. The worst was when she refused to jump a fence and bucked me off onto a paved road. I lost seven teeth and broke my nose. But my mother was right, too. I was fine. In fact, I rode Ladybug until I went to college and passed her on to another young girl. My mother and I ran a riding stable for many years after Dad left the Navy. The life lessons I learned while horseback riding--about independence, resilience, patience, responsibility, and forging my own path through the woods--gave me knowledge I still use every day. And so I have come full circle. I was a child who loved books and horses, a girl whose shelves were crammed with books that had horses on the covers. Now I write books for a living, and my newest novel, Folly Cove (Berkley, October 2016) has a main character who owns a stable and loves horses for the same reasons I do. 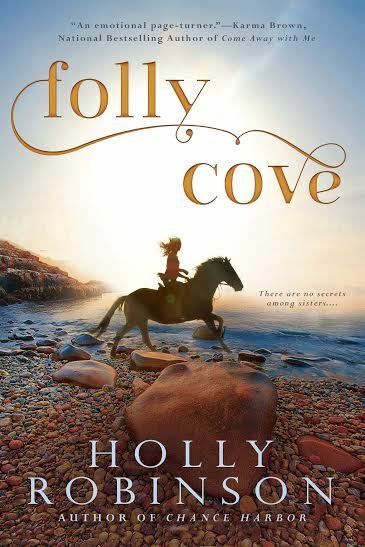 And this book has a lovely cover--one with a woman riding a horse by the sea. Who can ask more of life than this, to have your childhood dreams come true in ways you never expected?